Skin tan is a common skin disorder experienced by most of us. Chances of skin tan multiply many times during the harsh summer season. In summer, the UVA rays penetrate to the lower layers of our skin and produces melanin – a brown pigment that causes skin tan. Summer is here and I have received lots of request from users who are looking for scrubs and homemade remedies to get rid of skin tan naturally. If you are also struggling with skin tan and looking for best skin tan removal scrub and homemade remedies, then this is the post you can’t afford to miss. Apart from talking about skin tan removal scrub and homemade remedies, I am going to talk about everything else worth knowing about skin tan. We all dream to have tan free and healthy skin for it enhances the overall beauty and personality of the individual. With flawless gorgeous skin, you hardly need to apply any makeup to look beautiful. While on the other hand, no matter how beautiful your face is, having dull lifeless skin can hamper the overall look. There are several skin problems that we face on a day to day basis like pimples, acne, pigmentation etc. but among all of these one such skin issue that you may literally face every single day is the problem of skin tanning. The moment you step out in the sun, your skin tans and makes your complexion darker to an extent, that within a few days you will be able to see the difference between the exposed and covered portions of your skin. While it is necessary for everyone to carry an umbrella and wear proper sunscreen creams and lotions when going out, the best way to deal with the skin tan issue is by adopting the natural skin care remedies. There are various natural ingredients using which you can easily make natural skin tan removal scrub and apply it to get rid of skin tan easily. I often go outside for meetings, to attend events and I expose myself to the harsh sun rays. Even though I ensure that I am wearing sunscreen creams, I apply homemade skin tan removal scrubs regularly to deal with sin tan. Today I am happy to share the list of top 12 easy to make homemade skin tan scrub that has worked for me. Whenever we think of skin tanning, the first thing that comes to our mind is the scorching rays of the sun that degrades the natural complexion of our skin. But, you know despite the problem of skin tanning, adequate sun exposure is required as it is the best source by which your body makes the essential Vitamin D, which is very important and required by your body. Moreover, sunlight prevents several health issues including joint pains, arthritis and may also keep you energetic. Obviously, hiding yourself from the sun is not a solution. But, what you can do is take proper precaution and adopt healthy skin care routine to deal with skin tan. You can try using some of the natural homemade packs we are discussing here in this post. I personally think this to be the best option to try because you may not fear to go out in the sun as there are natural ingredients which will help you get rid of the skin tan. However, skin tan may not only occur due to the sunrays. We get our skin tanned when we visit sea places with salty waters all around. Skin darkening may also occur due to some skin diseases one of them being pigmentation. In addition, darkening of one’s complexion may also occur due to health problems like stomach disorders etc. Even, too much of stress and depression may make your skin look pale. So, you cannot blame the sun alone for your skin tan, there can be many factors leading to skin tan. Now, previously I wrote a post regarding natural remedies that was exclusive for sun tanned skin but my today’s post will be on tanned skin in general irrespective of the cause. In fact, these homemade packs will also be beneficial for people who want to lighten their natural brown skin in a healthy and natural manner as well. So, are you ready to discover how to get rid of skin tan using homemade skin tan removal scrubs? I heard you saying yes, so let’s dive in. Having a darker complexion is no big problem. In fact, many famous celebrities have gorgeous brown skin that looks lovely. But, the idea of today’s post is to bring out your natural complexion that has gone due to sun tan or several other factors. Dealing with skin tan is not an issue, especially when you know how to make homemade skin tan removal scrub easily at home. 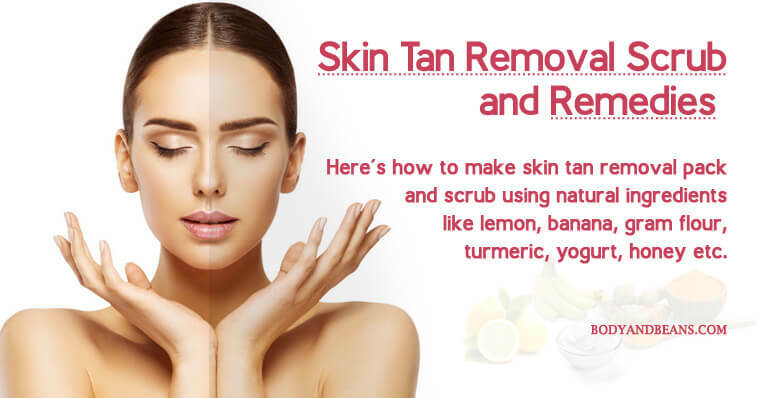 You can make best skin tan removal scrub using commonly available natural ingredients like lemon, banana, gram flour, turmeric, yogurt, honey etc. Listed below are a few quick and simple homemade skin tan removal scrub that can be made easily, and when applied correctly, it can enhance the natural glossiness, reward you with a flawless skin texture and help you get rid of the skin tan. The citrus fruits like lemon and orange have natural bleaching effects, thanks to the presence of Vitamin C and citric acid that makes your skin tone lighten, and help you get rid of the tan very effectively. Hence, the peel of these two is very beneficial for tanned skin. But, sometimes, using only the peel makes the skin little bit dry and so you also need to add a natural moisturizer to make the scrub more effective. When it comes to natural moisturizers, milk is definitely the best natural moisturizer. The lactic acid in milk exfoliates the dark skin layers and makes your skin bright, soft and supple. Hence the lemon or orange peel and milk pack is one of the best homemade scrub pack for tanned skin. Take 1 tablespoon of lemon or orange peel powder as per your choice and mix it with a tablespoon of raw milk. Mix the two well to make the paste really smooth. You may add more peel powders to get the necessary texture. After that, apply the pack on all the portions of the skin that has experienced tanning. Let it stay for around 10-15 minutes and then rinse the solution off your skin using water. 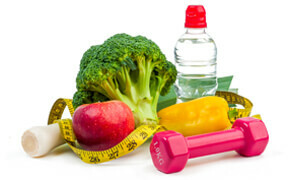 To get the maximum benefits, use the pack 2-3 times on a weekly basis. Precaution– Please do a bit of patch test before applying the pack on all of your tanned skin. If your skin is irritated, then avoid using it. Also, the ones who are allergenic to dairy products may skip this scrub. Another perfect moisturizing scrub that is very effective in tan removal is banana, mil and lemon juice pack. It is filled with healthy minerals and vitamins that perfectly keep your skin moisturized. Application of this scrub lends a natural healthy glow to your skin. And, for the best results, you can add a bit of lemon juice in it that further helps in lightening the skin tone. Adding little bit of milk is also recommended. Take around 1 teaspoon of milk and lemon juice and ½ banana. First you have to mash the banana well so that no lumps remain. Once mashed, add the milk and the lemon juice to mashed banana and make a nice smooth pack. Apply the mixture on your tanned skin. Keep it for 15 minutes and then rinse using lukewarm water. Use this pack at least 2 times a week to get rid of skin tan easily and naturally. Precautions– Banana is generally skin friendly and suits maximum skin types. As far as the other two ingredients are concerned, if your skin does not suit that, avoid them and use only the banana to get rid of your tan. This skin tan removal pack contains some of the best skin friendly ingredients that have been used in skin care since ages. The main ingredients here are gram flour and turmeric; both of them are highly effective against skin tan. Gram flour (or Besan as we call it in Hindi) contains several antioxidants that helps skin breathe and leaves behind a rejuvenating glow. It also helps remove all the impurities from the skin and make your skin fresh and clean from within. Turmeric on the other hand lightens your skin tone and makes the skin surface even and smooth. It is the presence of curcumin in turmeric that as per studies can treat several skin problems. The other ingredients that you may add to this pack to enhance the good effects are lemon juice and olive oil. Mix 2-3 tablespoon of gram flour, 1 teaspoon of lemon juice, 1 teaspoon of olive oil and a little pinch of turmeric powder and make a smooth paste of it. Apply the paste on the tanned portion of your skin and let it stay till it dries. Generally, it takes around 10-15 minutes to dry up. After that, splash some lukewarm water and rinse the paste off. Use this pack twice every week to get the maximum benefit. Yogurt or curd is the natural exfoliator of your skin. It contains several enzymes and acids that help you get rid of the tan and brighten your skin tone. Moreover, sun tanning often causes redness of the skin which is also reduced by yogurt. Besides, honey is another moisturizer that contains antioxidants which lessens the damage done by the harmful UV rays. Take around 2 tablespoon of plain yogurt and mix it with 1 teaspoon of honey. After that, apply the mixture thickly on your tanned skin. Keep it for around 15-20 minutes and then rinse using tepid water. To get the maximum benefits, you may use this remedy every alternate day. This face pack is actually a proper scrub that is very effective and is counted as one of the most useful homemade skin tan removal scrub. The sugar granules exfoliate the dead skin cells and remove the skin tan much effectively. Lemon is already a well-known bleaching agent that helps in lightening the dark skin tone and glycerin on the other hand, keeps your skin moisturized. Scrubbing in general is very good for blood circulation and helps to restore the natural complexion of your skin. Take a bowl and add around 1 tablespoon of lemon juice to it. Then add 1 tablespoon of sugar and ½ teaspoon of glycerin and mix the ingredients well. Now, apply the pack as a scrub on the tanned skin area. When you rub the skin, make sure you gently message it upwards. Continue scrubbing for 3-4 minutes. At the end, remove it using water. This is a great scrub and can be used twice every week for maximum benefit in dealing with skin tan. Cucumber is another ingredient that is highly skin friendly and is very effective in dealing with skin tan. Studies show it to be therapeutic in nature that gives both health and skin benefits. It keeps your skin hydrated and helps you maintain that fresh, healthy glow on your face. Lemon juice further adds to the bleaching effect and lightens the skin tone. Take a cucumber and cut it into half and then mash it. After that, add lemon juice to the cucumber pulp and mix well. Put the mixture on the tanned skin area and let it stay it for around 15-20 minutes, and then wash it off with water. This pack is generally safe for your skin and you can use it daily to deal with the skin tan naturally. Considering the name of the ingredients in the pack, you can understand how beneficial it can get. Each of the ingredients used is individually very good for skin and when they get mixed together, they become one of the best homemade packs for tanned skin. Fuller’s earth or multani mitti helps get rid of all the dirt and other impurities which lead to the enhancement of capillary circulation in your skin. It also removes the accumulated dead skin cells and the tan. Tomato juice on the other hand, interrupts the formation of the melanin and naturally helps in the lightening of the skin tone. As per research, sandalwood and rosewater are the skin friendly ingredients that further helps in rewarding you with a health glowing skin and so one should add these to the face pack for best results against tanned skin. In fact, these two are so safe and useful that you may also simply use sandalwood and rose water to deal with many of the modern day skin issues. Take 2 tablespoon of fuller’s earth, 1 tablespoon of tomato juice, ½ teaspoon of sandalwood powder and mix all of this with enough rosewater so that you get a paste having medium consistency. Apply the pack on our face and wash it off using water after 15 minutes. You can use coconut water in place of tomato juice as well. In short, this pack is great and youmust use it 1-2 times weekly. This is one of the most recommended homemade packs for tanned skin and you must definitely give it a try. The key ingredients are buttermilk and oatmeal, both of which are very beneficial for tanned skin. Buttermilk makes your skin smooth and heals the blisters that often occur due to the scorching sun rays, while the oatmeal exfoliates the skin and leaves behind a natural youthful glow. In fact, studies have proven oatmeal to be an all-round ingredient for skin care starting from being a cleansing agent to moisturizer to ultraviolet absorbers to having anti-inflammatory properties. Take around 3 tablespoon of buttermilk and 2 tablespoon of oatmeal and mix the two ingredients well. Massage the paste gently on your tanned skin for few minutes and then wash it off. This is a perfect scrub which you can use two times weekly for the best effects. I have personally used this pack and trust me it is great in dealing with skin tan. When used diligently, you will look as beautiful as the juicy red strawberries. Milk as you already know is a great moisturizing and cleansing agent but strawberries are no less. They are great exfoliators for the skin that helps to get rid of the dead skin cells and lighten the skin tone. The steps to make this scrub pack are very simple. You just have to take around 4-5 strawberries and mix with 2 tablespoons of milk. Make sure to crush the strawberries well. Then apply the mixture on the tanned portions of your skin. Keep it for half an hour and then wash it off. Use this pack two times weekly to get most of it. However, I know that the strawberry-milk mixture is tasty but control the temptation of gulfing it and use it only as a pack for your tanned skin. This is another wonder homemade tan skin removal pack and is rightly included in the list of best homemade packs for tanned skin. Aloe vera as you already know is great for your skin. It is a great soothing and anti-inflammatory agent that is simply magical for sensitive skin. Studies have already shown one of the benefits of aloe vera to be protecting your skin from the harmful UV rays besides many other skin benefits that it offer. Tomato on the other hand, is a great skin lightening ingredient, perfect for dealing with tanned skin. And, the last ingredient that is red lentil popularly known as masoor dal in Hindi is also a very beneficial tan removing ingredient. So all of these natural ingredients, when get mixed together, it give best results in dealing with skin tan. Make a rough mixture by putting around 1 teaspoon aloe vera extract and 1 tablespoon each of red lentil and tomato juice. Apply the paste on your tanned skin and stay for around 15-20 minutes. Then clean your skin with cold water. This is a great remedy and you can use this every alternate day initially and then use it three times a week to maintain its good effects. Well, if you thought that almonds are just for good health, then you are wrong. It can help you deal with the problem of skin tanning as well. Almonds are rich in Vitamin E and have natural bleaching properties. Moreover, using almonds in your homemade skin tan removal scrub will also help you deal with the side effects of sun tanning, one of them being skin burn. To intensify the good effects, you may like to add some lemon juice and the very skin friendly rose water to it. Take around 4-5 almonds and grind them in the rose water and make a granular paste out of it. Then add around 1 teaspoon of lemon juice and properly mix all the ingredients and its ready for use. Apply the paste on the tanned portions of your skin and scrub for around 2 minutes. Let it stay for 3-4 minutes and then rinse it off. Apply this scrub twice every week to get maximum benefit in dealing with skin tan. Well, this is one of the simplest homemade packs for tanned skin where you do not have to mix any other ingredients to get rid of skin tan. Papaya is a great exfoliating agent having brightening enzymes that helps you deal with the skin tan effectively. It also leaves a cooling and soothing effect on sun burned skin. Take a raw papaya and grate it to make the perfect papaya paste. Apply on the tanned parts of the skin. Keep for 15-20 minutes and then wash using lukewarm water. Papaya is a safe ingredient and suits maximum skin types, hence you can use the papaya pack every day or every alternate day as per your wish. Most of us want to have flawless, bright and healthy skin. We do whatever it takes to deal with the most common skin issues like tanning, acne, pimples etc. being a girl, I can confirm that most of do not hesitate in trying any cosmetic brand that promises to offer healthy, glowing and flawless skin. But, needless to say that most of these beauty and cosmetic products contain chemicals that may make your skin bright but may also hamper the overall skin quality. So, I personally prefer going the natural way. Nature has gifted us with so many ingredients that possess natural skin lightening properties. When we use these ingredients correctly, it can transform the quality of our skin and make it flawless. We have already discussed about 12 of the best skin tan removal scrub that can help you get rid of skin tan naturally and easily. The ingredients that is used for the skin tan removal scrub is readily available and skin friendly. These homemade remedies are not just effective in dealing with skin tan, but they are beneficial in dealing with other kinds of skin darkening issues. Preparation and application of these skin tan removal scrub and packs are very easy and does not take time. The maximum time you have to spend is 30 minutes, which I am sure, you can manage out of your busy schedule. After all, it’s about dealing with skin tan and getting flawless skin naturally. However, some tanning occurs due to health complications. So if you find that you are diligently using the packs but there are no improvements, then may be its time to contact your doctor. Till the time you are unhealthy and sick from within, no matter which scrub and pack you apply, the illness is going to be reflected on the skin. Are you tired of tanned skin? Looking for natural skin care remedies to deal with skin tan effectively? Try some of the skin tan removal scrub as we have discussed above and let me know how it works for you. How do you deal with skin tan? Ever tried any of these skin tan removal scrub and mask to deal with skin tan? Feel free to let us know what remedies and packs have worked for you? Until next post, be good, look good and feel great.